Beach wedding hair accessories add that little bit of extra WOW factor to your hairstyle and your overall look for your wedding day. Definitely do not skimp on this. 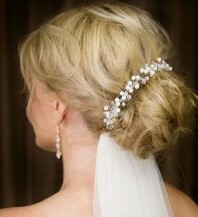 There are really many choices available for bridal hair accessories and beach brides also have a lot to select from. They also need not cost the earth! Tiaras are absolutely the most elaborate wedding hair accessories you could ask for. They come in all shapes and sizes from super formal, to much more relaxed and arty. They therefore also come in all sorts of prices, from diamond tiaras that could cost as much as your honeymoon, to simple wire and bead ones you could make yourself. Add a few shells you found on long walks with your fiance to make it extra special! The best thing about Beach Wedding Tiaras is that they can lend height to a shorter bride if that is what you are looking for. Since wearing heels on the beach is out, a tall tiara that makes a point at the top could give you a bit of extra height if you feel you need it. And besides, a bride should always feel like a princess on her wedding day! 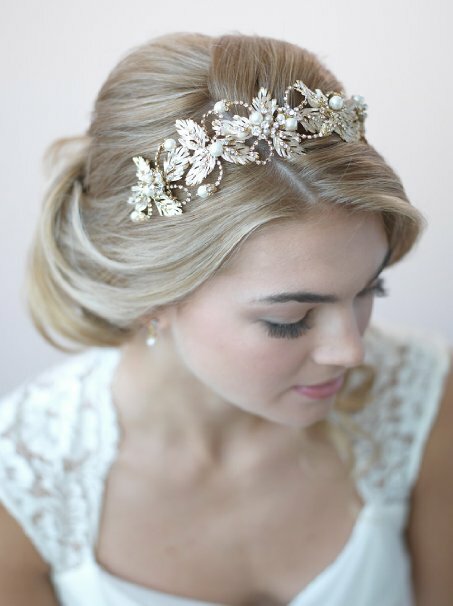 For more info on tiaras as beach wedding hair accessories as well as tips and how to's on making your own, please click here. Headbands make great beach wedding hair accessories. They can also be made from any kind of material from fabric to lace to metal to beads and pearls. The great thing about Beach Wedding Headbands is that they can also be chosen to compliment your formality, can suit any type of theme, can totally be handmade by yourself or a creative friend and they are also useful on a windy beach to keep your hair under control! Want to know more? Follow this link to read more about headbands - where to buy them and how to make them. You might think that a bride should wear a veil as it is tradition and your family or future in-laws might even expect you to, but always remember that it is your day and you should wear what you want. With that being said, veils do have their place as wedding accessories and also as beach wedding hair accessories. A well chosen Beach Wedding Veil can create a great contrast against dark hair, can balance out a larger skirt by giving you volume around your head or they can elongate you if you use a longer veil that is attached at the back of the head. They can also be teamed with flowers or a tiara. 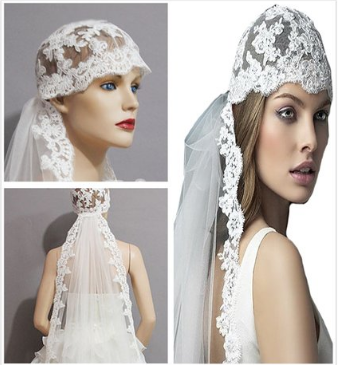 Find out more about using a veil as one of your beach wedding hair accessories here. Hair jewels can be great beach wedding hair accessories as you can use them to dress up any type of hairstyle and they can even be used on very short hair. Hair jewelry can include pearl and rhinestone pins that can be placed randomly to decorate loose waves or curls or can accentuate a chignon or french twist. You can also choose hair screws. These can be attached to the hair in a twist action in random areas. Some of them also have small beads and crystals dangling from them. Hair combs also come in all shapes and sizes with bead-work, shells or flowers attached to them. The comb part is what attaches to your hair and once it is on, it is invisible and only the decorative part is visible. Hair Jewels and Combs are great as accents and they also help to keep your hair in place. Fresh flowers are perfect beach wedding hair accessories as they give you such a summery fresh feeling. They are normally inexpensive (depending on the flowers you decide to use) and can work with any hairstyle or any hair length. Just make sure you choose flowers that will last in the heat on the beach. Many brides also opt for succulents and these teamed with coral and shells look very nice. A bun wrap is an oftentimes circular accessory that is used literally to wrap around the circumference of your bun or chignon. They can be made from material, lace, wire-work, beads etc. They are great to accentuate your bun and to keep it in place. Hair vines are very similar to bun wraps, but are normally made from wire and beading or some other more elastic material. They are also not circular and you can literally place them anywhere on your head. They can be used as a type of hairband, to run the length of your french roll, to snake down the side of your messy up-do or your curls, and they can also be used as a bun wrap around your chignon. 1. Don't overpower your dress. If you have a simple slip dress then go for more elaborate hair accessories. If you have a dress with lots of beading and detail, then skip the hair accessories or go for something very simple. 2. Always choose your dress first. Once you know what your dress will look like, then you can choose the accessories to complement it. 3. Decide on your hairstyle before choosing your accessories. Your comb, tiara, hairband etc should be the finishing touch on your hairstyle. 4. Less is always more when it comes to a beach wedding so tone down all your other jewellery. 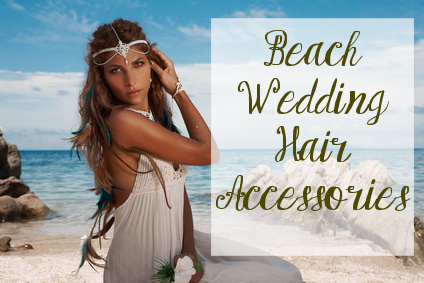 Also check out the page on Hairstyles To Go With Your Beach Wedding Hair Accessories. Here you will find some great ideas on how to style your hair on your wedding day.